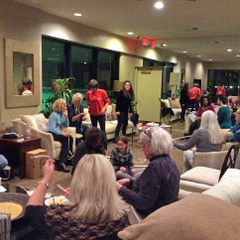 Gathering of women for the Lake Pontchartrain Knot Tea Party. Are you a woman interested in literally sailing into your future? Or perhaps you already know how to get across an ocean using the wind? Or maybe you’re just curious about sailing in the desert? The knot tie tea party is for all of you. I’m the national Women’s Sailing Association president and will be the lead knot teacher at Lake Pleasant on Saturday, March 23, from 3-5 pm. This will be the first monthly National Women’s Sailing Association’s Learn About Sailing Things (L.A.S.T.) workshop for women sailors in the greater Phoenix area. 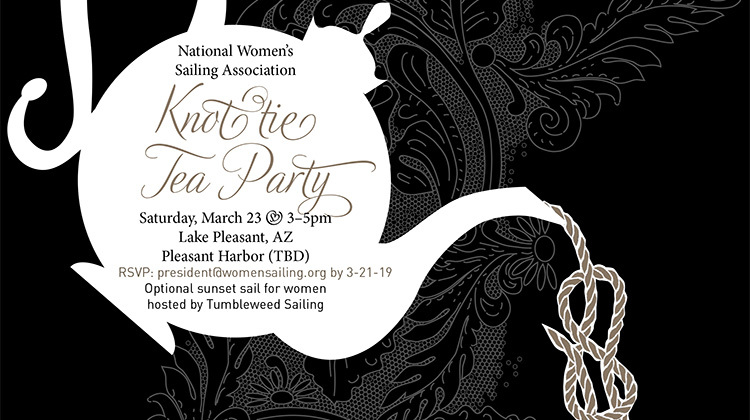 At the Knot Tie Tea Party you’ll socialize, drink tea (or a beverage you choose), learn to tie a few useful nautical knots or show others how it’s done if you are so skilled, and watch the sun as it lowers over the lake and we decide what to learn next about sailing. The L.A.S.T. group will gather at the blue-topped shuttle shelter in the public parking lot at Pleasant Harbor. Turn right after you enter the facility and the lot is on your right. There’s a $6 fee to enter the park. Our friends at Tumbleweed Sailing will provide refreshments…tea and crumpets. Bring your favorite tea cup. If you’re able to join us, please RSVP to me by this email.